O+ USA has been in the Philippine market for around 3 years. The smartphones they’ve released recently like the O+ Air caught my attention and I thought it was a pretty nice phone, as well as the O+ 360. Thankfully, the folks from O+ USA and myself finally had a chance to meet with each other last month, and the first unit they gave me to evaluate was not a smartphone, but of all things a 2-in-1 Convertible! I’ve been using convertibles lately like the Asus Transformer Book T100, the Cherry Mobile Alpha Morph and the Starmobile Engage 10 Pro so maybe they thought I should review their O+ Convertible first. Why not? Well then, here’s my O+ Convertible Review! Of all the convertibles I’ve used and evaluated, I found the O+ Convertible the most attractive of them all. Removing the unit from the box lead to “Oooohhsss” and “Aaaahhhsss” from the baristas in the coffee shop I was working at. The gunmetal finish on the cover adds some sophistication to the Convertible, especially the small logo of the brand that actually stands out even when seen from afar. 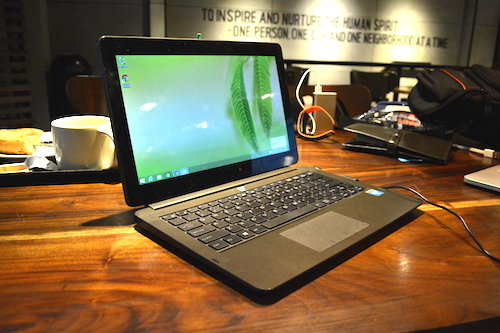 It looks sleek when closed unlike the usual chunky laptops you see everywhere. Opening the Convertible reveals a large screen and a spacious keyboard with a trackpad and another logo of the brand found at the the center. 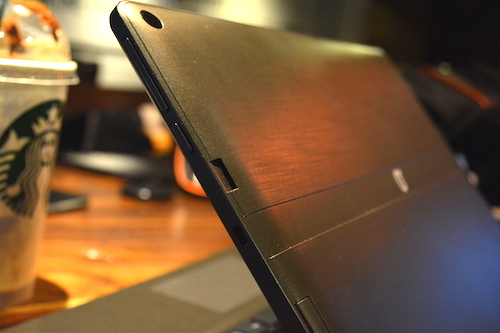 The slate can be removed just by simply pulling it off from the keyboard. Be warned: the slate can’t be easily pulled off thanks to its magnetic latch. 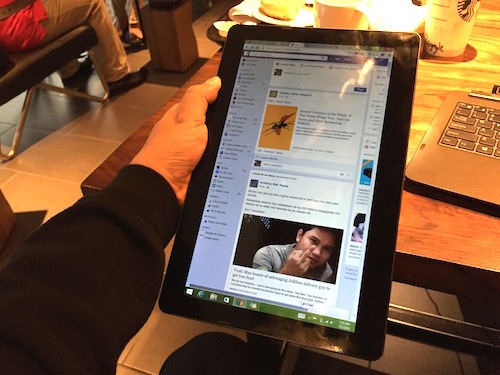 As a slate, it may be too big and a bit heavy to use compared to the usual 7-inch tablets we see in the market. Not for me as I usually remove it from the dock to read some news or documents for an hour. 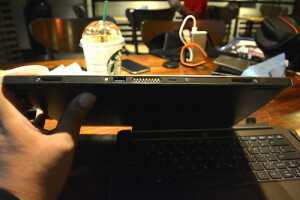 The headphone jack and power button are found at the top of the slate while the volume buttons, Windows button and a Micro HDMI port are found on the right side. 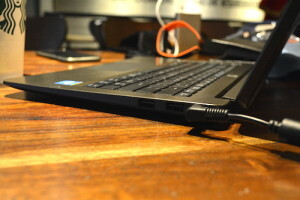 A USB slot is found under where you can connect USB peripherals and a Micro USB port for charging. I’m kinda surprised that the package came with a pair of headphones, and the reason for this is because the headphone jack only uses the smaller 2.5mm plug. If you want to use your favourite headphones, get a 2.5mm-to-3.5mm adapter. By the way, there’s a Micro SD card slot that is expandable up to 128GB if you need extra storage on the slate. 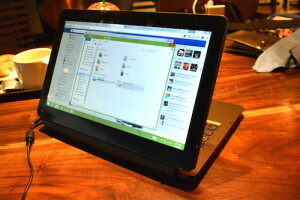 The O+ Convertible’s screen measures at 11.6 inches with a resolution of 1366×768 pixels. I usually prefer 10″ Convertibles, but the bigger size of this convertible is a welcome change. Personally, I think a 12-inch ultrabook is the sweet spot for laptops (though I’m not keen to get a new MacBook) so this is the closest I can get for now. The large screen is a godsend as it is easier for my eyes to view compared to my 10-inch slates. The quality of the display is good enough for browsing websites, viewing photos or watching videos. You’ll need to wipe it with a cloth once in a while though if you keep on poking on the screen. What I also like aside from the O+ Convertible’s large display is its keyboard dock. I was able to type my blog posts easily thanks to its spacious keys. 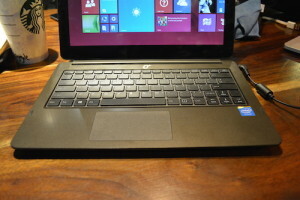 They’re not as big as the HP Stream which I have reviewed a few months ago, but it’s still better than the smaller keyboards of 10-inch 2-in-1 convertibles. I wish the trackpad is placed at the center as my left hand accidentally touches it once in a while. 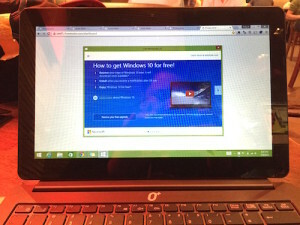 I also wish that the trackpad supports gestures of Windows 8, but it’s not a big deal for me since it has a touchscreen anyway. The keyboard dock comes with a charging port, 2 USB ports and a 500GB drive to store additional files. 2 USB ports is not common for a convertible at this price, and I’m glad that O+USA added that extra feature because, you know 2 USB ports are better than 1! 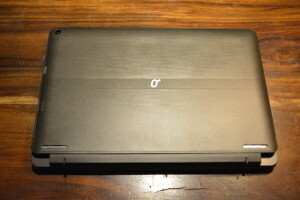 O+ Convertible in slate mode. Pardon the pic in my FB feed. I’ve been using the O+ Convertible for almost 2 months and it became my reliable companion after a bit of a rough start. For some reason, I’ve encountered a few bugs in my first week of usage, but all the Windows updates that were installed on my Convertible fixed them and it became very stable up to this day. Sadly, I wasn’t able to test any games with it due to my workload, but the good news according to fellow tech blogger and good friend Bon of Taragis.com said he was able to play the classic version of DOTA with it. 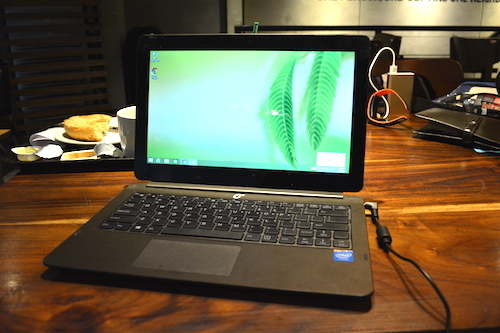 It boots up and shuts down quickly and is able to manage all the tabs and browsers opened in Google Chrome. 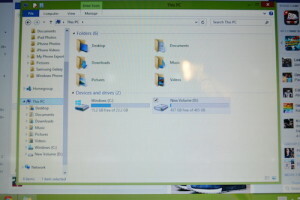 I haven’t installed Microsoft Office yet as I don’t see any need for it, but if you need to, it wouldn’t eat too much of the slate’s 32GB internal storage as there aren’t any bloatwares installed by O+USA. As of the moment I have 13.8GB free out of 23.2GB, imagine if this was another known brand with bloatwares installed I would’ve been left with 8GB. 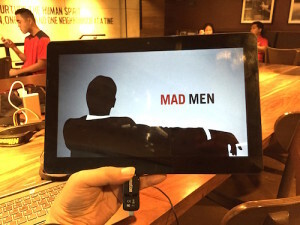 It’s able to play HD Videos without any issues. My caveat though are the speakers which aren’t audible enough with most of the audio and video files I play. The O+ Convertible is already pre-installed with Windows 8.1 and was easy to set up. A couple of weeks ago, a pop-up appeared on my Convertible’s screen advising me that I can upgrade to Windows 10 for FREE! I’ve already reserved it for the Convertible, and will install it within the week. I’ll update this section or create a new blog post once the upgrade is made. Among all convertibles I’ve used, the O+ Convertible has the shortest battery life at an average of 4 hours of continuous usage. I haven’t figured out why, because others can last up to 11 hours or at least 6 hours. Because of this, I have to bring its power brick along with me. Glad that the charger isn’t bulky at all. 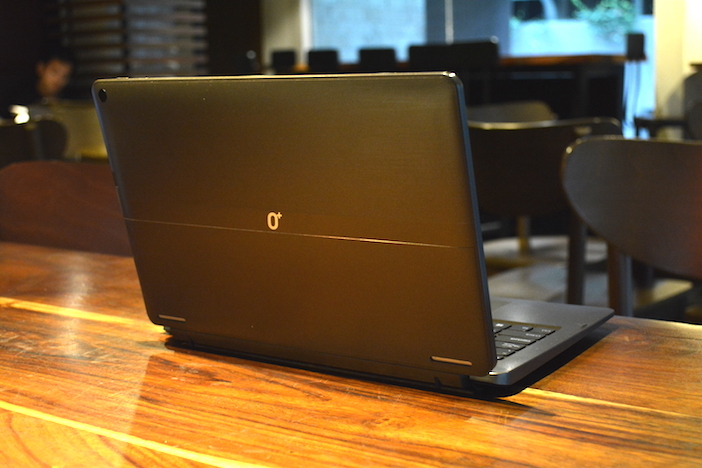 At Php 15,999.00, the O+ Convertible is the most affordable 2-in-1 I’ve seen from an international brand. I bring this along with me wherever I go because I favour the 11-inch screen over its 10-inch counterparts. The same can be said about the keyboard which has additional ports and storage. So if you need a larger 2-in-1 convertible with a price that doesn’t break your wallet, I absolutely recommend the O+ Convertible!